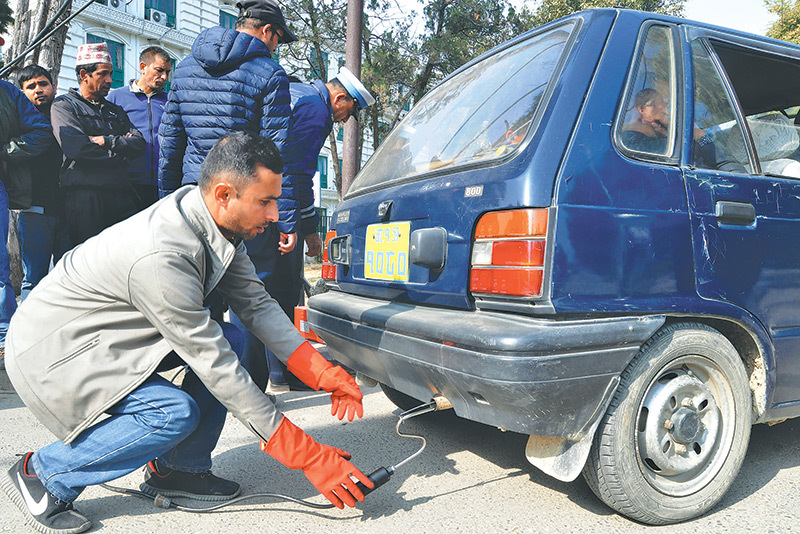 Nov 30, 2017-A joint team of Department of Environment (DoE), Metropolitan Traffic Police Division (MTPD) and Department of Transport Management (DoTM) conducted emission tests of vehicles owned by various government agencies based inside Singha Durbar on Wednesday, as per the decision of the Quick Action Team that was formed earlier this month to tackle the problem of air pollution in major cities of the country including the Kathmandu Valley. Out of 30 vehicles that underwent the emission test on the Singha Durbar premises, most met the emission standards, said Govinda Lamichhane, environment inspector at the DoE. “We started from one of the inner streets of the Singh Durbar and ran random test of passing vehicles. Most of the vehicles that we tested were found to be complying with the pollution standards,” he added. While all petrol-run vehicles passed the test, two diesel-run vehicles failed to meet the emission standards. According to the existing emission standards, petrol vehicles manufactured before and after 1980 should not emit carbon monoxide (CO) more than 4.5 per cent and 3.5 per cent respectively in its total smoke density, said Prem Singh, acting director general with the DoTM. For older and newer diesel-run vehicles, the CO should not cross more than 75 per cent and 65 per cent under Hartridge Smoke Unit (HSU). In a bid to minimise air pollution, a multi-stakeholder meeting held at the Office of the Prime Minister and Council of Ministers (OPMCM) on November 17 had formed the Quick Action Team consisting of officials from different ministries and departments. The first meeting of the team had decided to start emission monitoring from Singh Durbar, discourage burning of garbage in open area, effectively implement green sticker programme, and prepare a report on condition and adverse impacts of air pollutants, among others. “Seeing the decreasing quality of air in Kathmandu Valley, we have decided to increase such monitoring. After Singh Durbar, the team will be reaching out to various other routes of the Valley,” said Umesh Ranjitkar, MTPD spokesperson. The MTPD has booked a total 1,243 vehicles between October 17 and November 29 for pollution infractions. Among the booked vehicles, 768 did not have valid green stickers and 466 were found emitting heavy smoke. However, the monitoring process is affected with limited sets of emission testing machines. Currently, the DoTM has only three such devices in Teku, Sano Bharyang and Ekantkuna. “With naked eyes we can see smokes coming out of the vehicles, but we cannot produce proof to vehicle owners and book such vehicles. With more testing devices, vehicle owners will know how they have been polluting the environment,” added Ranjitkar. Besides, there is no clarity on penalty to vehicles breaching the emission standards, said Singh. “Such vehicles should not operate, but we do not have any law regarding that. So far we have been only asking them to fix their vehicles to limit the emission,” admitted Singh, adding the DoTM is working to come up with specific fine to polluter in near future. The DoTM is also planning to buy 40 new emission test devices within two months to enforce the emission standards throughout the country.